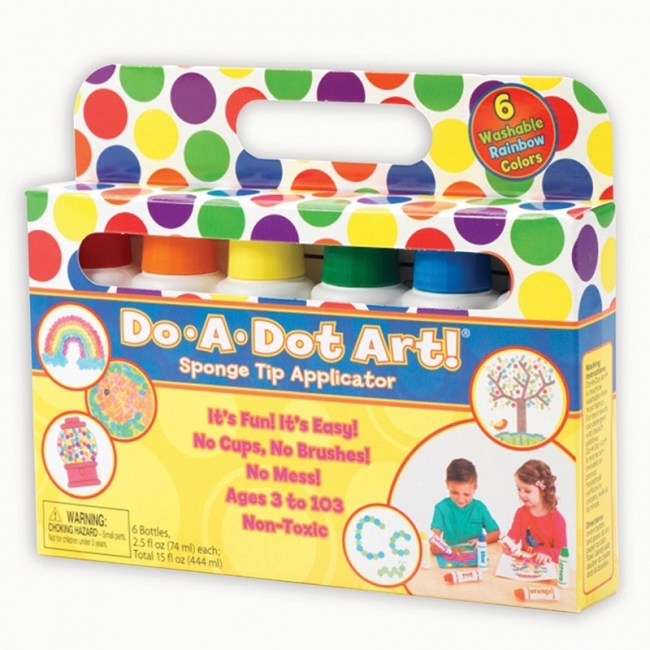 Explore what's over the rainbow and dot away with this set of Do A Dot Art! Rainbow markers. Arts and crafts time just got easier and cleaner with Do A Dot Art! This set comes with 6 washable dot markers in no spill, no splash bottles, which is a dream come true for parents and teachers. Do A Dot Art! is incredible for developing hand eye coordination and color recognition for young children, and is the first art medium every young child should use. Let your imagination run wild with this set of primary rainbow colors. Includes: Red, Orange, Yellow, Green, Blue, and Purple. Washable with easy set-up and easy clean up. Dries quickly. Sponge tips never dry out. Easy to grip bottles for little hands. Special formula allows you to mix, blend, and layer color. Each marker contains 2.5 ounces of ink. Made in the USA.